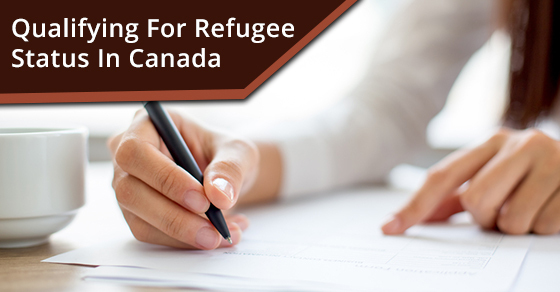 Below you will find information regarding the process to qualify for refugee status in Canada. The first step is to make a refugee claim. The length of time it takes to process your claim depends on the location of where you made your claim and whether your country is a Designated Country of Origin. If your claim is eligible, as determined by immigration officers, it will be referred to the Immigration and Refugee Board of Canada. You can submit your claim at The Port of Entry (POE) or Inland CIC office. However, certain requirements must be met in order for your refugee claim to be referred. Please see below. Please note that Canada also recognizes that certain individuals who currently live in Canada but who are at risk of being removed may be put in danger as a result of going back and need to be protected. If this applies to you, please see if you are eligible for a pre-removal risk assessment (PRRA) . 30 to 60 days after you have submitted your claim, a refugee hearing will take place. Here you will be asked why you left your country, why your country can’t protect you and why you would be at risk if you returned. A lawyer or immigration consultant can represent you and make a case for why you should be granted refugee status. Max Berger Professional Law Corporation is a leading Canadian and full-service immigration law firm since 1987 that can help you get granted refugee status. For more information, contact us here.